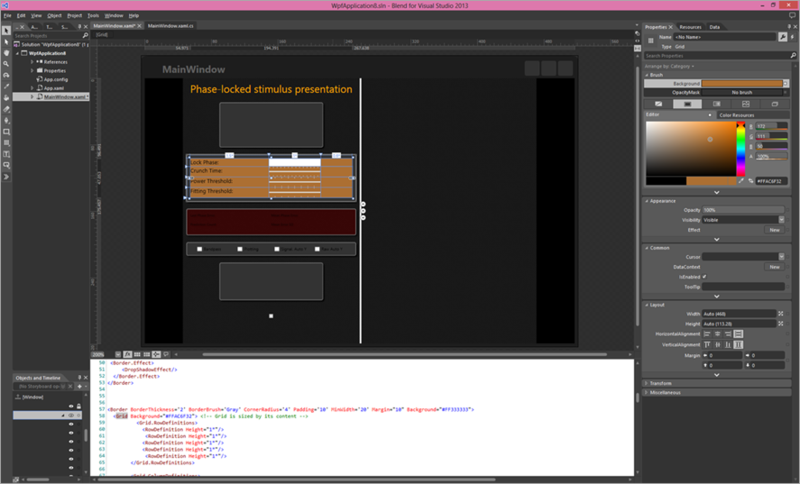 EventIDE allows using the XAML language for creating vectors graphics stimuli, interactive user interfaces and the customizable status screen. XAML is a rich and powerful language, but learning all XAML features and syntax can be a difficult task for beginners. Although EventIDE provides several XAML templates and basic code completion, there is much easier and better way to become a friend with XAML. Recently, Microsoft has developed a nice visual designer for XAML, called Blend. It’s a free tool, supplied together with Visual Studio Express (also free). To get Blend, download and install Visual Studio Express available under this link. Note that you need the VS Express for Windows Desktop edition specifically. Once Visual Studio is installed, search and run ‘Blend for Visual Studio’ in parallel to EventIDE. If you still want to write XAML code, you can enjoy the delightful code completion and error-highlighting mechanisms in Blend. To activate the code completion, just start typing in any position. All errors that you make will be automatically highlighted and correction will be suggested right over the code. Once you finished XAML design, copy a block the XAML code within the root grid element and paste it back into the XAML editor in EventIDE. You don’t to save the project in Blend, unless you plan to re-use it. Once you switched back to EventIDE, don’t forget to add or restore add data bindings to your variables and custom XAML controls (e.g. one provided by Chart element), which are available only within EventIDE.